This review will examine a product called Medi Soul Lip + Lip Plumper. It is formulated to restore the total lip volume, reduce wrinkles on the lips and enhance furors. The manufacturer promises that this product will redesign and reshape your lips within 15 days of use, and therefore is a perfect solution if your lips lack volume and have been affected by fine lines and wrinkles. All these ingredients play different or complementary roles in this product. For instance, Castor oil helps to soften the lips. Vitamin E provides relief from irritated and chapped lips. Wheat Germ Oil has soothing and hydrating properties. Cinnamon naturally plumps up the lips because it very mildly irritates the skin of the lips just enough to make it redden and swell lightly. With the increased blood flow in this area, the lips start to swell slightly resulting in fuller and plumper lips. Before applying this plumper, you are advised to spot test it for reaction, because some people experience an allergic reaction from it. Apply a thin layer to your lips; do not use the product more than 3 times daily because one of the ingredients (TuLip) may cause a numbing sensation of the lips or the tip of the tongue. You must also not use it if you are allergic to TuLip. 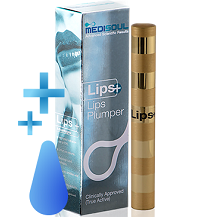 Medi Soul Lip + Lip Plumper is available for purchase through the manufacturer’s website for $29.00. This price is much higher than most products that we have reviewed, which cost between $19 and $23.00. Unfortunately, it is not available through third-party retailers. Therefore, you will pay what you see on the manufacturer’s website if you really want the product. There are also no specials or discounts offered. Sadly, there is no money-back guarantee provided. We looked through the website, and the only information that we could find only advises consumers to return the product if it is damaged or if it is a wrong product. Therefore, if you buy this lip plumper you need to remember that you will not get your money back if it does not work for you. Medi Soul Lip + Lip Plumper appears to be a good product for plumping your lips. The manufacturer promises that you will see the results within 15 days. All the ingredients are natural. They are also honest and make consumers aware of the possibility or an allergic reaction, which is good because customers should be made aware of all the important information about the product that they want to purchase. However, this possibility of an allergic reaction is a negative thing because there are many lip plumpers that will not put you through that. Secondly, there is no money-back guarantee on this lip plumper, despite putting your lips at risk, and losing the money if it does not work on you. There are also no consumer reviews showing how other consumers experienced Medi Soul Lip + Lip Plumper, except for one review on the producer’s website. We do not believe in this product, as a result, we do not recommend it.